Gas In the Rock Tumbler Barrel? 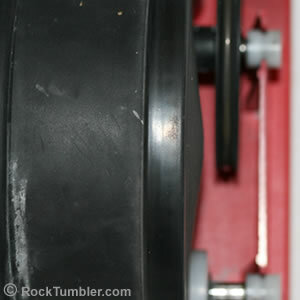 Home » Rock Tumbling Library » Gas In the Rock Tumbler Barrel? 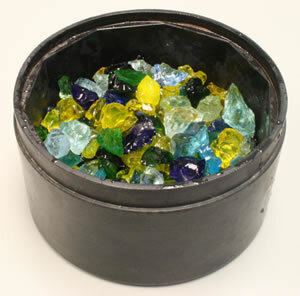 Some types of man-made and natural glass can generate gas when tumbled. Keep an eye on barrel pressure or use baking soda to prevent a gas build-up. It's True, Glass Makes Gas! One day I started my Lot-o-Tumbler with a load of landscape glass and it was running great. When I checked the tumbler the next morning the lid had popped off and the slurry had evaporated to a thick mud. I didn't think too much about it. I assumed that I didn't have the lid firmly seated. So, I rinsed the glass and started the tumbler again. Later that day the lid was on the floor again. I was really surprised because I had intentionally placed the lid on firmly. It happened a third time and that convinced me that the glass was producing enough gas to pop off the lid. This problem was easily solved. I simply poked a tiny hole in the lid of the Lot-o-Tumbler and that allowed future gas to escape. A build-up of gas in a rotary tumbler is a much greater problem. If the lid pops off the stones and tumbler mud will go all over your tumbler and all over the floor. It is not a fun mess to clean-up. Most of the rocks that people run in a tumbler do not make enough gas to cause a problem. However, any man-made glass and any natural glass (such as obsidian and Apache tears) should be considered as a potential gas generator. Blast furnace slag, metals, metallic ores, and a few other natural and man-made materials can also produce gas. The amount of time that a material spends in the barrel can also be important. Some people (including me) will often add a little extra grit and a little extra water and tumble a barrel of rocks for two, three or four weeks without opening it. In that situation a rock that produces very little gas can have the extra time needed to build up enough pressure to unseat a lid. Check your tumbler barrel often if you are tumbling glass. In this image you can see that gas pressure is causing the bottom of the barrel to bulge out. If you are running a rotary tumbler with a rubber barrel it is easy to watch for a build-up of gas in the barrel. You should check on your tumbler a couple times per day. When you do this you should be able to detect if the barrel is inflating. The next time you start tumbling, examine the barrel - especially the bottom. Look at the shape and press on the bottom with your finger to become familiar with its shape and tension. Then when your are checking on the tumbler pick up the barrel and look to see if the bottom is bulging or if it is harder to press in with your finger. A bulging barrel or a hard barrel is a sign of gas pressure in the barrel. Leakage around the lid can also be caused by gas inside. 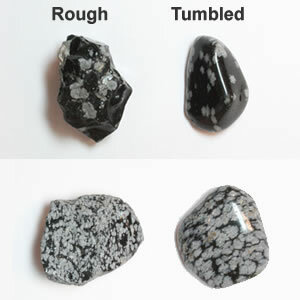 Natural glass such as obsidian and Apache tears can produce gas when tumbled. If you detect pressure inside, place the barrel in a plastic tub, remove the retaining ring or metal cover and slowly/gently press the rim away from the lid to allow any gas to escape. Point the opening of the barrel away from you and towards the side of the plastic tub. It is unlikely that anything will spray from the barrel but take this precaution just in case. Wear safety glasses for eye protection. Some people call this "burping the barrel". Before restarting the tumbler make sure that the rim and the lid are clean and no grit or rock particles are going to compromise the seal between them. Some people add baking soda to the tumbler barrel to counteract gas. Steve Hart, author of Modern Rock Tumbling recommends adding 1/2 teaspoon of baking soda to the barrel to avoid gas problems. A little prevention can save a big mess.